The original secure metal toolboxes by Tuffboxes are available in traditional Tuffbox blue, and our Charity Pink Tuffbox edition. Designed and manufactured in Britain to offer an affordable, no-fuss, choice for tradesmen and construction sites across the UK. The BikeShed will hold two standard handlebar mountain style bikes. Professional Builder magazine put two of their guys to the test to see how long it could take them to get into their Tuffboxes filled with tools. Needless to say, even the angle circular saw wasn’t getting into the box easily! All Tuffbox Toolboxes are made from 100% steel welded construction, with anti-theft hinges, prop for the lid and unique keys and locks to stop anyone requesting a new set and steeling your tools. Areas prone to attack with a crowbar have been doubled in steel, and the weather resistant coating means they can be stored outside, in a garage or van with faith your tools are safe from the elements. They’re called Tuffboxes for a reason! 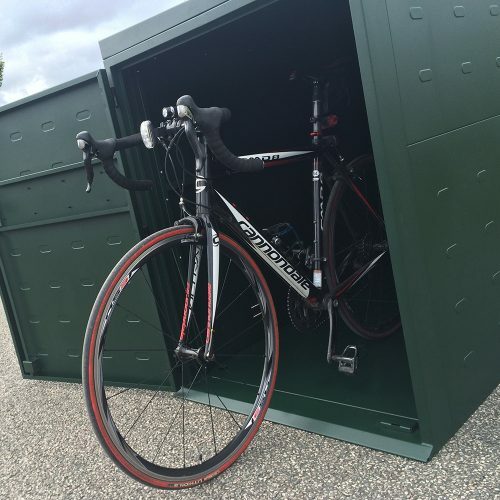 Our bicycle storage shed is made from galvanised steel, with a welded and riveted construction to make it lighter for assembly, but secure against thieves. A multi-point locking system and metal flooring help keep your bikes or garden tools secure while in the garden. Like our Tuffbox Toolboxes, the BikeShed has a phosphate powder coated finish to protect it against the elements and help prevent rusting of the metal bike box. Security products to keep your valuables safe at home, work or on-the-go from tool storage boxes to large secure bike sheds. Designed & manufactured in Great Britain. Read more About Tuffboxes. Here’s some Magazine Coverage. We’ve moved into a new home!